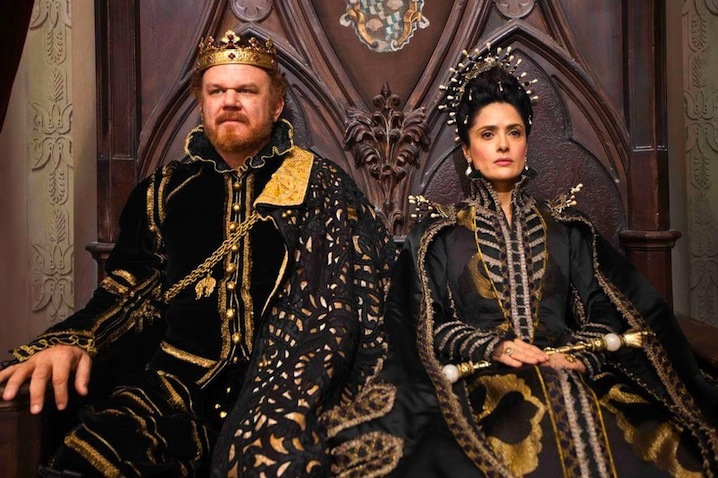 Monty Python by way of Tim Burton and “The Princess Bride,” Italian director Matteo Garrone’s first English language feature “Tale of Tales” is a nutty compendium of outrageous fairy tales unfolding within the constraints of a single unseemly kingdom. Although wobbly in parts like so many cinematic anthologies, Garrone’s alternately silly and entrancing adaptation of Giambattista Basile’s Neapolitan stories provides a welcome gothic antidote to more stately treatments of similar material. Garrone’s bizarre narrative incorporates four overlapping stories in a kingdom filled with the usual ensemble of mythological beasts, magical powers and royal schemes. While every sequence goes to certain outrageous extremes — plot twists include the consumption of a giant sea monster’s heart and the nurturing of a dog-sized flea — Garrone cuts between them with a fluid approach that successfully conveys the perception of a self-defined world. Eschewing narration or title cards, the filmmaker plunges into a series of mysterious events while developing the sense that they all feed into one big, twisted universe. Garrone wastes no time unleashing the weirdest dimensions of his project with his first entry, the story of a supportive king (John C. Reilly) who ventures into the ocean to slay a giant beast on behalf of his gloomy wife (Salma Hayek) in order to bring her back its heart under the understanding that her consumption of the organ will impregnate her. Needless to say, after an amusingly gory dining room scene, it does just that, while also knocking up the maid in the process — leading to the rather unusual situation of magical twins born to different mothers. Just as that story takes off, Garrone shifts to a slightly more grounded tale involving two wrinkly elderly sisters (Shirley Henderson and Hayley Carmichael under heaps of makeup), one of whom manages to attract the affections of another traveling ruler (an enjoyably over-the-top Vincent Cassel) after he hears her singing from afar. Afraid to reveal her face to her powerful suitor, she concocts a scheme to attract him with a single finger, though the situation misfires in ways both deeply morbid and oddly hilarious. While that story takes on exceedingly peculiar directions, Garrone moves on to a pair of connected storylines involving yet another eccentric leader (Toby Jones, more in tune with his slapstick potential than ever before), who comes into the possession of an unexpectedly affectionate insect that balloons to beastly proportions under his care. That relationship inadvertently (and through a scenario so loony it’s not worth spoiling here) leads the king to marry off his anguished daughter (Bebe Cave) to a brutish ogre, who imprisons her in his dreary lair. With some of the best practical effects this side of “Pan’s Labyrinth,” as well as castle scenery and surrounding forestry that may as well stem from remnants of the “Into the Woods” set, Garrone’s movie is blatantly derivative while refashioning its material into his own satisfying playground. Despite the discombobulated structure, the filmmaker manages to create a fully involving world. He’s aided to that end by both veteran cinematographer Peter Suschitzky (“The Empire Strikes Back,” “Mars Attacks”), whose complex color scheme fleshes out the storybook feel, as well as yet another awe-inspiring Alexandre Desplat score. The craftsmanship sustains the story through a series of kooky twists, none more surprising than a finale that expertly pulls all the pieces together at once. As with Garrone’s “Reality,” in which a desperate everyman attempts to get cast on a reality television show, “Tale of Tales” pulls off a tricky balance between dark comedy and striking allegorical depth. Despite some of the more absurd punchlines — a woman tossed from a window and caught in trees by her skirt, the aforementioned sea monster heart scene — “Tale of Tales” doesn’t so much play for laughs as it hovers in a strange dimension between thematic sophistication and pure surrealism. At times it even veers into horror mode, as in one memorable bit involving the voluntary flaying of human flesh out of sheer vanity. There’s plenty of material to dig through in terms of the movie’s potential as social criticism, including a feminist slant involving its suppressed female characters lashing out, and the casual nature of tyrannical behavior from all of the regal figures on display. But the bigger picture revolves around the dangers of institutions and the mad delusions they create. Garrone’s last two movies, the crime saga “Gomorra” and “Reality,” focus on corrupt power structures and their impact on various facets of society. “Tale of Tales” transforms that motif into a flamboyant skewering of capitalist fantasies that drive people to all kinds of insane behavior, to the point where it calls into question the whole concept of living happily ever after — but gets there anyway, though by then nothing is certain.